More homeschool planning: our schedule...? Actually, though, the real reason I tried to plan out our future schedule was more so that I could get a better picture in my own head of what homeschooling would really look like for us, in real life as opposed to in theory. I also wanted to make sure I would allow for enough quiet, ordinary time at home. 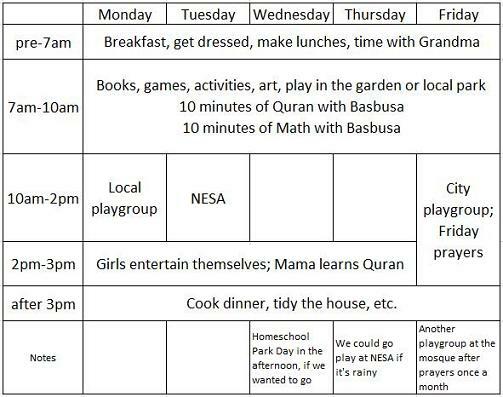 Our lives lately have been a bit too busy: I've been taking the girls to plenty of homeschool-oriented activities and playdates, so that we'll have plenty of friends once we start homeschooling for real insha'Allah, but meanwhile, Basbusa still has preschool two mornings a week. We've been running around all over the place, and Basbusa really doesn't have the stamina for it yet. The ensuing fussiness, plus the experiences I've heard about from other very busy homeschooling friends, has convinced me that I'll need to be more careful about not cramming too much into our lives, rather than worrying about finding things to do and people to do it with! NESA is New England Sports Academy, which has a great set of offerings for homeschoolers during the day while most kids are in school. Basbusa wants to do gymnastics, so insha'Allah we'll sign her up for that, and the bonus is that any kid enrolled in their classes (and the kid's siblings) can come play for free in their gym on Tuesdays and Thursdays. That should be a lot of fun, let us get to know other families, and give us somewhere to play when it's cold or wet outside. And we have two nice, quiet days per week left open, for just hanging out at home, or going to the Children's Museum, etc. Sound ok...? 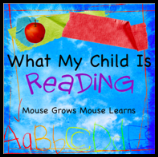 I'd love to hear any feedback, if any experienced homeschoolers stumble across this! We've never really done monster books or dinosaur stories, since Basbusa has always been more attracted to the talking-animals and magic-worlds genres :) But this week, all of a sudden, two monster books made her list of favories! 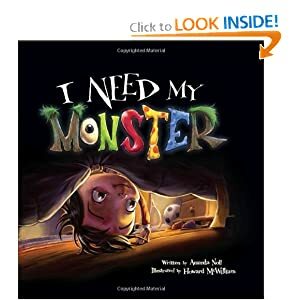 I Need My Monster is about a boy named Ethan whose under-the-bed monster, Gabe, goes away on a fishing trip. Ethan is most disconcerted. How can he possibly fall asleep "without Gabe's familiar scary noises and his spooky green ooze?" So he knocks on the floorboards to call up a temporary replacement. Four monsters arrive in quick succession to fill the post, but none of them fulfill Ethan's criteria, for various funny reasons. I think what attracted Basbusa to this book was the tension between scariness and humor, and between nervousness and affection. Are the monsters really scary, since Ethan clearly loves the truly menacing Gabe? I think Basbusa could also identify with Ethan's need for familiar routines, even if it was the reassuring consistency of a familiar scariness! I also liked the rich language used to describe the monsters, so this book was definitely a hit with both of us. 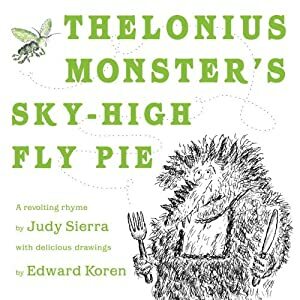 I chose Thelonius Monster's Sky-High Fly Pie because we had accidentally found and enjoyed Born to Read, by the same author. It's a quick, funny read, about a hospitable monster who invites his eleventeen disgusting-est friends and relations over for a pie filled with flies. But since he unfortunately forgot to bake the pie, the flies take off, and the pie zooms out the window. It's light, not scary at all, and told in rhyme, so Basbusa often picked it off the shelf for a quick read. 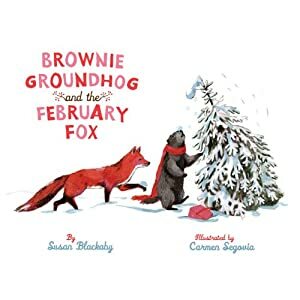 Brownie Groundhog and the February Fox was (yet another) great recommendation from Amy, whose fantastic description I won't try to emulate. Suffice it to say that Basbusa loved it as much as Amy's daughters did. 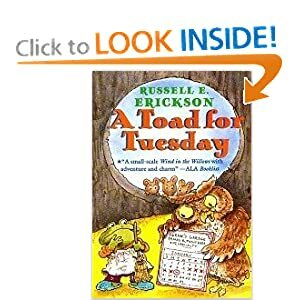 Our most recently-finished chapter book (as opposed to the three which are currently in progress) was A Toad for Tuesday, which both Basbusa and I enjoyed. The story sounds pretty mundane when I try to sum it up - an owl catches a toad, but in the end they become friends and the toad doesn't get eaten - but actually there were enough little quirks and twists in the plot to make it an engaging tale. Plus, both the owl and the toad had very detailed and convincing little personalities, which made it all the more interesting to follow their adventures. One other thing I really liked about this book was the descriptive language it used. 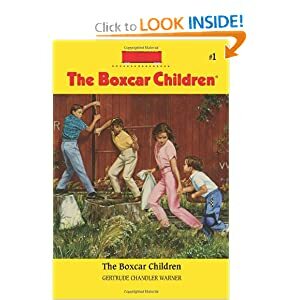 Basbusa is definitely most interested in plot at this point, and doesn't enjoy sitting through long descriptive passages while waiting for something else to happen (probably one of the reasons why she enjoys the Boxcar Children so much). But I do want to expose her to the beauty of language along the way, and this book had a perfect mix of action sprinkled with description. For example, as Warton the toad first leaves his cosy hibernation to set out on his adventure: "Warton started up through the long tunnel that led up to the top of the old stump they lived under. When he stepped out, he was dazzled. The brilliant snow glistened and glittered, and the deep blue sky was filled with puffy white clouds that drifted over the tall evergreens. Snowbirds twittered gaily as they hopped from branch to branch." And then off he went on his skis, and promptly got them tangled up and fell over, much to Basbusa's entertainment. 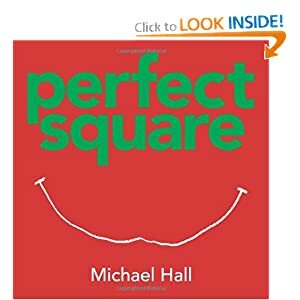 Perfect Square was listed by Mama Smiles as one of their favorites, and Basbusa certainly loved it too. It's not exactly a story in the sense of having characters or even a plot, but nonetheless it manages to convey both the beauty of perfection and the beauty and possibilities created by imperfection. It also shows how versatile and exciting even the most ordinary supplies can be - in this case, a square of paper - given some imagination and creative thinking. As for what actually happens in the book? Well, a square of paper gets torn apart and reassembled a bunch of times. Doesn't sound too fascinating, I know, but Basbusa enjoyed it! 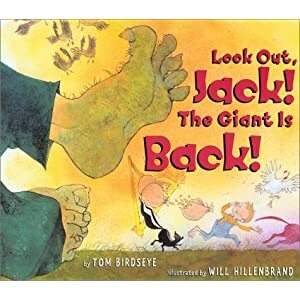 After our joyful discovery of The Lorax a while ago, I'd been keeping my eye out for other Dr. Seuss books we hadn't heard about. 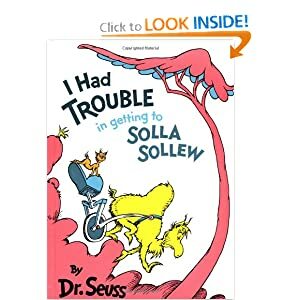 I walked past I Had Trouble in Getting to Solla Sollew a few times because the name seemed kind of cumbersome, but I'm so glad I finally bothered to actually look at the text! Like The Lorax, both the plot and the rhymes were very funny, and there was an inspiring message thrown in to boot (namely, that there's no point in trying to run away from your troubles; you just have to face up to them). Such a good read-aloud, and Solla Sollew has become one of the primary destinations of Basbusa's imaginary train journeys. The Enchanted Wood, however, was right at her level. 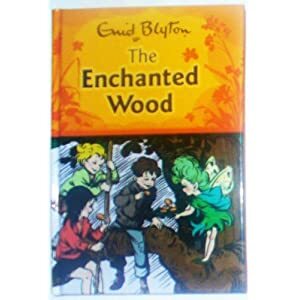 It was one of my own childhood favorites, and Basbusa loved hearing about the adventures of Jo, Bessie and Fanny up the magical Faraway Tree. There are two sequels, which I remember reading just as eagerly as a child, but actually, reading them again now through a mother's eyes, I'm putting them aside for now rather than reading them to Basbusa. Both of the sequels have "naughty child" characters, and the plots tend to center around these children's faults. Their failings are also continually commented on by all the other characters - not exactly name-calling, but too close to it for (my) comfort. The first book in the series, though, is a celebration of children's delight in magic and adventure. 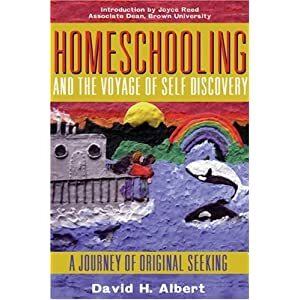 I'm going to add here a few quotations from Homeschooling and the Voyage of Self-Discovery which I found particularly insightful, so that I can refer back to them later when the books themselves are back at the library. His ideas don't translate immediately into a to-do-list or a lesson-plan, but I found them helpful as I continue trying to define exactly what my aspirations are for the girls' education. I love a lot of the ideas behind child-led learning - I think we'll lean more towards unschooling than to school-at-home - but the more child-led things get, the more difficult I think it would be to make any kind of assessment about whether the child's education is progressing towards something. I'm sure at any given moment, I could come up with reasons for why the child's current activities are valuable, but would there be a discernible overall direction or progression...? I think the quotations below will help me view a frameless kind of educational plan through some kind of a framework. p.49: "Whenever we are stuck in our homeschooling routines, whether it be around math or anything else, I am learning not to be frustrated with my children, but to step back and ask myself three questions: Have I provided what is necessary so that my kids can discover the beauty in what they are learning? Have I given them opportunities in the present to use it? Do they have models in front of them to which they can aspire if they put in the necessary learning effort?" I am convinced that these conversations, taken together, represent the individual and unique, yet fundamentally human, need to search for truth, not as a machine-like apparatus registering facts, but in the mastery of material and spiritual life." p.98, explaining what he means by the 'conversation with Oneself': "I call this the conversation with Oneself, to stress the intimation that one may have that the self is larger than one's own individual ego. If you are of a religious frame of mind, you may think of it as a conversation with God or the Divine, or, as I like to think of it, with the Inward Teacher."